No one has ever doubted that Doge Enrico Dandolo, the 39th Doge of Venice, was clever. His audacious appropriation of the forces of the Fourth Crusade to serve the ambitions of Venice is irrefutable evidence that he was a master of intrigue. The only question is whether he planned the events of 1201-1204 from the beginning or merely reacted brilliantly to opportunities as they unfolded. In the First Crusade of a hundred years earlier the Europeans had captured Jerusalem, Acre, Tyre and other cities of the Holy Land and installed a Frankish monarch to govern the new kingdom. In the intervening period the Saracens had recaptured the territory and successfully defended it against the forces of the Second and Third Crusades (except for Acre, which was recovered by the Europeans in the Third Crusade). By 1200, under the urging of Pope Innocent, leadership had emerged in France and Germany for a Fourth Crusade to be launched with a new strategy. 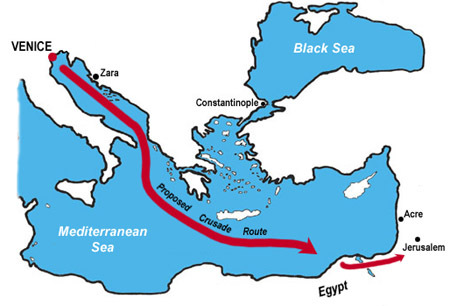 The new plan was to attack the Saracens from the opposite direction, travelling by ship to Egypt and marching eastward and northward from there to the Holy Land. Only Venice had the resources for transporting an army such as the one the French and German leaders envisioned. In 1201 a delegation from the north arrived at Venice to commission construction of a new fleet of warships and transports for the enterprise. Venice agreed to supply, at a cost of 84,000 marks, transportation and nine months of provisions for a Crusader army of 4,500 knights and 19,000 squires and foot-soldiers. Moreover, Venice agreed to supply fifty additional galleys on her own, in exchange for the promise of one-half of any territory captured on the Crusade. June 1202 was set as the time for the Crusaders to gather at Venice, pay for the fleet and embark for the attack on Egypt. Did Doge Dandolo and the Venetians foresee already that the Crusaders had badly overestimated the size and financial resources of the army that they would gather? The evidence suggests that Dandolo may have already been working a separate agenda: at the same time that arrangements with the Crusaders were being concluded, Venice was also negotiating a treaty with Egypt that almost certainly included a mutual promise of non-aggression. Only in the following year did Venice's individual goals begin to surface.